Glacier FarmMedia’s outdoor farm show Ag in Motion has wrapped its 2018 edition and booked a single-day record for attendance. The show, held July 17-19 near Langham, Sask., northwest of Saskatoon, reported three-day attendance of 30,355, including record attendance of 11,425 on the Wednesday. That single-day gate included more attendees than the three-day total for the first Ag in Motion in 2015, the company said Monday. The show included exhibits from 459 agricultural companies, up from 209 in 2015, according to Glacier. Ag in Motion’s Innovations program, run in partnership with Saskatoon Regional Economic Development Authority (SREDA), drew 36 entries this year in four categories. CropPro Consulting’s SWATBOX (agribusiness services). The 320-acre Ag in Motion show site took on another 320 acres in 2018 for a new applied research farm project, in which a wheat crop has been seeded and is being maintained for harvest this fall. The research project, operated in partnership with Bayer Crop Science, Morris Industries, Nutrien Ag Solutions, Stoller, Versatile and AGI, is meant to show “how tweaks to inputs impact yield and therefore the bottom line,” Glacier said. Results from the project are to be released this fall, with an expanded program in the works for 2019, the company said. Ag in Motion also partnered with Morris, Bayer and other supporting companies on its inaugural Field of STARS, a fundraising event and concert on the Tuesday in support of the STARS air ambulance service’s operations. Field of STARS organizers reported the event alone raised $526,000, but also received a donation from the Canadian Canola Growers Association, bringing its total to $626,000. 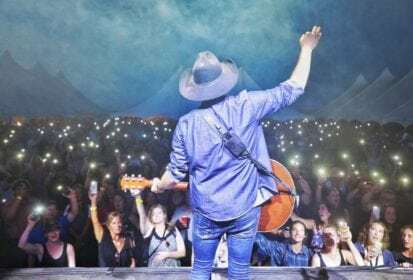 Over 1,200 people came to the Ag in Motion site for the Field of STARS gala, which included a steak supper, live and silent auctions, presentations and a concert by Alberta-raised country performer Brett Kissel. “Any time you are holding an event for the first time there is certain degree of trepidation but, as they have done many times in the past, the ag community stepped up to support STARS,” STARS CEO Andrea Robertson said in a separate release.